Ask A Librarian: How can I get my product or book viewed by librarians? 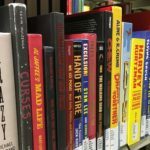 14Jan19 • Comments Off on Ask A Librarian: How can I get my product or book viewed by librarians? I started 119 books this year and finished 114. All the stats are for the books I finished.